This is the version of the guide that will continue to be updated. I've kept version 1.43 on page 1 of this thread (down below) for those who need a version without server failover. I'm keeping this version here in case anyone wants a non-failover version of the guide. - updated digitmaps on pages 5, 6, and 15 to reflect that Freephoneline supports some N11 codes. Note that dialing 411 with Freephoneline costs money. "The Service does support 411 calls, which shall be charged at a rate to be determined from time to time by FPL, and it also supports 311 calls where available." I made this a sticky- Thanks for all your help! Also, OBi200/202 firmware threads can be found at http://www.obitalk.com/forum/index.php?topic=9983.160 and http://www.obitalk.com/forum/index.php?topic=13484.0. At this time, firmware 3.1.1 (Build: 5804) and 3.2.1 (Build: 5794EX) are the last official firmware versions for both the OBi200 and OBi202 that support XMPP. This version doesn't support OBiExtras. The EX version supports OBiExtras. These firmware versions work with the guides in this thread. It doesn't matter whether you use the EX firmware version, even if you don't subscribe to OBiExtras. Obviously, if you do subscribe to OBiExtras, you'll need the EX version of the firmware. These firmware versions were reported in this thread: https://www.obitalk.com/forum/index.php?topic=13484.20. There's modded firmware available now, but using it may void the warranty on your ATA. I would prefer not answering questions related to the use of that firmware, but it might be useful for those that know what they're doing. That said, use it at your own risk, and please don't ask me to troubleshoot issues relating to it. I accept no responsibility for any problems arising from its usage. For those that want to ask questions about it, do so over here: http://www.dslreports.com/forum/r317927 ... rmware-mod. Respectfully, please do not post questions about this user-hacked Obihai firmware on these forums. The related site is located at http://www.obifirmware.com/. The following information hasn't been added to the guide since it's possible that Obihai is going to address this issue in a later firmware update. 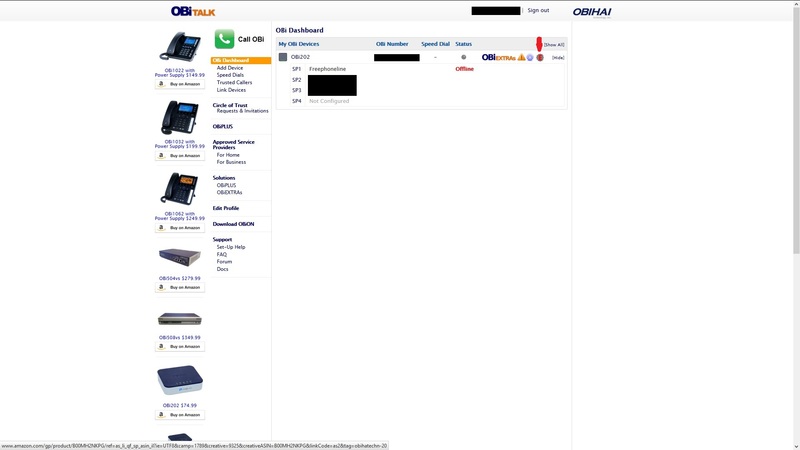 If you used the Obitalk web portal (http://www.obitalk.com) to configure your ATA, keep in mind that you must continue using it to configure your ATA. Otherwise whatever settings you change will eventually be overwritten by what you previously entered at obitalk.com anyway. If you wish to disable this behaviour, dial ***1. Enter the IP address you hear into a web browser. Navigate to System Management-->OBiTalk Provisioning-->select Disabled for the method. Save. Reboot ATA. Now obitalk.com won't overwrite whatever changes you make via the device's interface (via IP address). That grey cog wheel with the "E" is for the expert configuration menu. under "Advanced Options" and finally selecting "Enable OBi Expert Entry from Dashboard." Otherwise, dial ***1. Enter the IP address you hear into a web browser. 2. If T38Enable is enabled, change T38Reinvite to "callee only"
Liptonbrisk wrote: The following information hasn't been added to the guide since it's possible that Obihai is going to address this issue in a later firmware update. This issue has been fixed in the latest firmware version, 3.1.1 (Build: 5804). If you're on that firmware version (or later), there's no need to follow the quoted instructions. In this guide, they going to show you how to register the Zoiper softphone to an OBi200 / OBi202 allowing you to make and receive calls via a mobile, tablet or PC. http://forums.redflagdeals.com/google-v ... d-2189964/ for more information. 3.2.2 (Build: 5859EX) works with the guides posted in this thread. That's really 3.2.2 (Build: 5859EX). I'm glad the manual download link was found. However, that link is now dead. Obihai killed it. 2) once the official version of 3.2.2 (Build: 5859EX) is installed you can't apply the hacked firmware version of 5.2.2. (Build: 5859EX). Another user has posted a manual download link for 3.2.2 (Build: 5859EX): http://www.obitalk.com/forum/index.php? ... 0#msg91090. 3.2.2 (Build: 5921EX) is the latest firmware version. 3.2.2 (Build: 5921EX) works with the FPL PDF guides posted in this thread. 3.2.2 (Build: 5921EX) works with Freephoneline. PDF guide has been updated. Refer to the first post for the PDF file.